KSS Modular Assembly further compliments KSS. 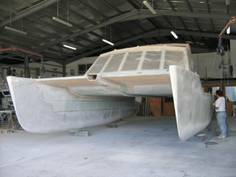 Kelsall Catamarans' special designs allow the catamaran's structure to be first produced in three separate modules. Final assembly can be delayed to close to launch date. This approach substantially improves the efficiency of almost all tasks involved. 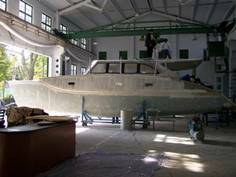 Each module is readily reached by the boat builders from the workshop floor. This represents both time saved and an increase in quality coming from the ease of access to each job. When we introduced Resin Infusion and combined it with designs for Kelsall Modular Assembly, we introduced two very strong incentives to go all out for what we call the full KSS kit system. The KSS Kit approach sees each part being made on a mould table. The table needs to be the length of the boat and width ot suit. A kit of panels can be made from accurate offsets that are supplied for every part of the structure to be made. Lines and markings on the various panels control assembly. These are applied while they are being made on the table. Modular assembly is often appropriate, to allow for construction away from the water, to fit into an available building space or just for the efficiency of working at floor level. A considerable amount of time can be saved if you are not climbing into and out of the boat every ten minutes. Bridge-deck fronts, saloon tops and saloon fronts are the main application for this idea. KMA is a very simple concept. Take the central module. It is designed to be built up on a flat base, with straight or slightly curved sides. Hence, instead of fitting the saloon sole to the hulls in space, the panels for the base are joined as needed and the kit added piece by piece as one would a kit of parts for a building. Clearly even more of this kit could be full sandwich and even more could have edge treatment in preparation for joining. Bonded joins, using matching angles or radii came next. Put a radius batten along the edges to come together and assembly would only involve the appropriate bonding material instead of full laminating on both sides of the join and all that that entails.Edge treatment added on the table will always represent a big saving. The saloon top edge is obviously an important line where any un-evenness is going to stand out and which takes skill and time in the ordinary way would be so much easier if using some form of edge batten which will take a fair curve when set down on the table.